Some EPs coming up, this and the next post. These don't have a lot in common other than they're all from 1975, a fairly good year for Bollywood soundracks, in general. That said, Sonik Omi's 'Shahi Lutera' leaves me surprisingly cold and I'm not sure why I at one point convinced myself I needed it. Bits of 'Gore Chehre Pe' has a sort of cool mystic vibe and 'Dil Se Dil Takra Lo' is moderately poppy, but both they and the two other tracks are really rather underwhelming, unfortunately. 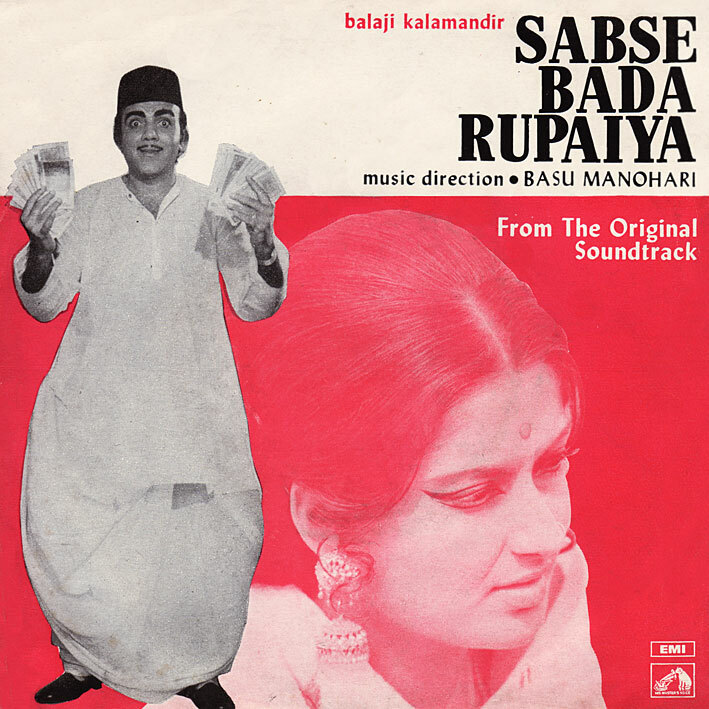 'Sabse Bada Rupaiya' by Basu Manohari (another previously unposted team) is better. 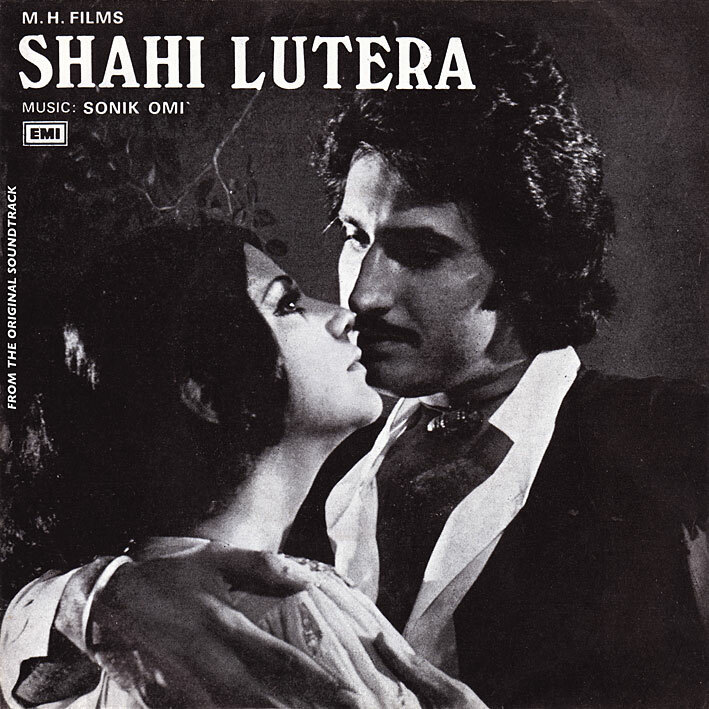 The title track especially is a cool organ and guitar driven souljazz-tinged number, again somewhat indebted to RD Burman stylistically, but that's not unnatural considering both Basu Chakraborty and Manohari Singh had worked as assistants for him. I'm not a huge fan of actor/singer Mehmood but I like this song, it's catchy and it's fun. 'Bahi Jaiyo Na' is quite pretty as well. No Laxmikant Pyarelal in the foreseeable future I'm afraid, I've currently nothing by them that I haven't already posted. Thanks PC for such wonderful share.ryt nw I m talkng about sabse bada rupaiya. Basu ManoharI are from RD camp so music has to be like RDBs..or my be RDs own compositions and that was greatness of RDBs no claim fr work..
Coming back to compositions..I have already heard all songs..I initially heard waada karo but later when I gt hold of complete album..the rythms of each song were mesmerising... the ever melodious wada karo...then dariya kinaare has typical RD Burman school of rythm..Lata Mangeshkar managing the song beautifully..whch otherwise I feel shd have been sung by Ashaji...bt credits to lataji as well..
Then song bahi jaiyo na anther song wth typical rd burman school of music.. the ryrhm so extra ordinary. In all a great composition.. The only setback fr me was tht waada karo is edited version..and is shorter version.. I agree, the shortening of tracks for the EP format is a bit annoying.